Update on event: Great turn out! Raised about $1,500 and registered 15 donors. The Leukemia and Lymphoma Society’s (LLS) Team In Training is on a mission-to help find cures and more effective treatments for blood cancers. These treatments can also lead to possible cures for other types of cancers. Like the other members of TNT, we will be raising funds to help find cures and better treatments for the blood cancers. This disease has impacted the life of someone we love dearly and that is why we are running the Nike Women’s DC half-marathon on April 28th as part of Team In Training. You can learn more about this organization at http://www.teamintraining.org/nyc/. How serious is blood cancer? Every four minutes, someone new is diagnosed with blood cancer. Every 10 minutes, someone dies. Getting a bone marrow transplant is the only fighting chance a blood cancer patient has right now to make a full recovery from this disease. 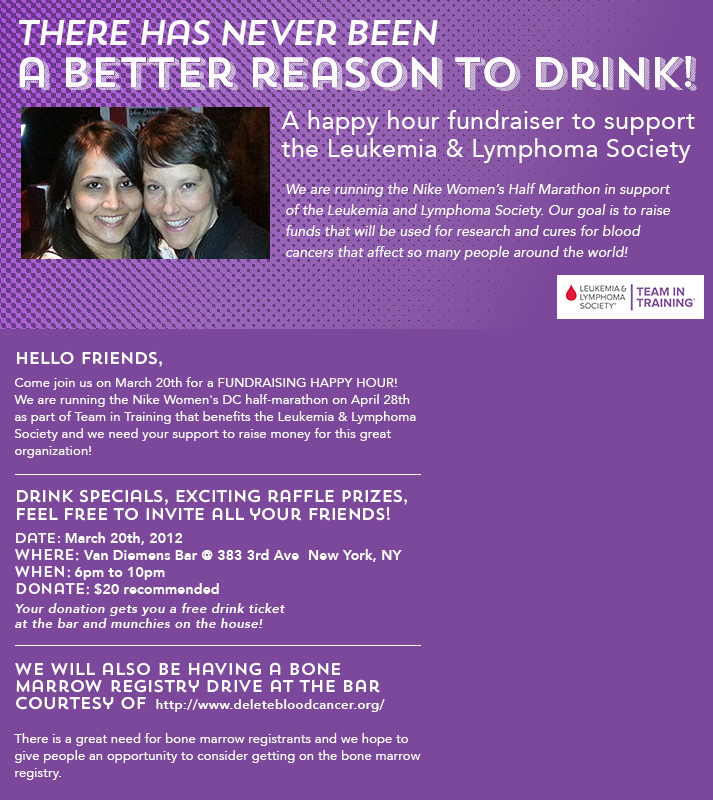 Please see flier below for Happy Hour details or visit our FB event page. This entry was posted on March 19, 2013 by arpitaj80 in Story and tagged #bonemarrow #bonemarrowregistry #dkms #teamintraining #happyhour.